No no no, I am not getting married. But this weekend was a wedding filled event. I went to Pensacola, FL for my good friend Laura Reid’s wedding. It was a fun weekend, though I was ready to get back and into the swing o’ things. I really ‘girled’ it up…we had pedicures and manicures on Thursday upon my arrival (which I have to say…I really like my nails, which usually I cannot stand to paint. My toes are ALWAYS painted but never my hands…feel like it suffocates them..?!) and Friday we went out on a mini-sail boat. It had a name, something like a Hobe? It was great! Very cool. Then it was the rehearsal, rehearsal dinner, drinks of course, and Saturday was just filled from start to finish. We even went to an Aveda salon and got our hair done (as I was in the wedding). The wedding was at 5:00, went off without a hitch in one of the most beautiful churches I have ever seen, I believe it is one of the oldest churches in the country? I will post a pic if I get one from someone…and the reception was just a fun time. I am not into going out to bars to dance, but I sure love to at weddings! This morning I returned at 6:30 AM, which meant my wake up call was 4:30. So…needless to say, I am pretty tired and managed to ride for 1.5 hours this afternoon but in the 99-degree Austin heat it was a struggle. But, a very fun weekend! A refreshing change of pace, for sure. Also…I decided to ‘go for it’ and sign up for Chicago Triathlon! This was on my schedule, but I was feeling ‘raced out’ a bit. However, I have some great college friends who will be competing as well and I will stay with them. And I have been finding myself very excited to race this year, which is a change from past years. I have NEVER ‘disliked’ racing but usually I am happy saying “I’ll skip it…” and just keeping my races limited. But you know, I do not wake up at the crack of dawn to train most days only to hit up a second workout mid-day for nothing! The races are the reward…even if they don’t go as I want them to, I rarely walk away without learning something and/or just enjoying myself! Well, I got back from a few days in Indiana and it was NICE! I decided that after Racine, I needed a week off from training. Well, I tried my best…I did not ‘train’ per-say, but I did some nice easy things. 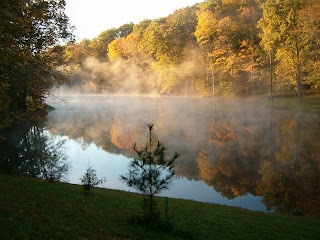 My parents have a place about 1 hour south of Indianapolis, and it is BEAUTIFUL. Tucked back in the woods near Brown County, on a small lake. I took a walk with my mom one morning, I swam in their lake and I drank wine. 🙂 It was nice to take some time to reflect on the weekends race and also, clear my mind of things. We can get so wrapped up in the daily grind, whether that is work, training, or even our personal life…there is nothing better than to sometimes slow down and well, literally do nothing. A few evenings, my mom and I went down to the dock around 5:00, swam for 20-30 minutes, then enjoyed some wine while we fished. Didn’t catch much, as they just must not have been very hungry…but it was so beautiful, you would never realize that Indiana could be so gorgeous and peaceful. I feel like I am ready for the second half ‘push’ of my season. It is so easy to be hard on ourselves. I mean, I went into Spirit of Racine truely wanting to and believing I could win it, or maybe finish top 3. Finishing 6th, I could be disappointed…but then, I put up a best time and I felt fantastic. I had my parents there supporting me, I had a few great friends there as well, and I am lucky enough to go out and do these amazing ‘things’. In reality, I feel like the luckiest person in the world. And I can honestly say, I take absolutely nothing for granted. But being able to slow down this past week, step back and take some rest time, it allowed all of this to ‘soak in’ so to speak. One thing that I believe I struggle with is ‘selling myself short’. 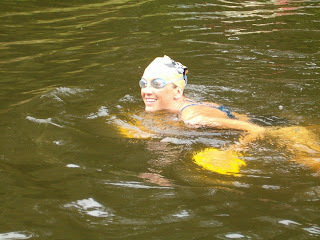 In the midst of having a great race, or coming out ahead in the swim (where I am winning the race!) I start to think “OK, when will they start passing me…” This is something I am working on, not thinking this but rather thinking “Hold ’em off. And if/when they pass you, keep them in sight.” I am trying to tell myself I belong to be up at the front, that this is where I am fully capable of being. I think that my ability to step away from the sport, the intensity and just appreciate being a part of it all allows me to keep things in perspective. In any case…these are my thoughts for the day. 🙂 May not be worth too much, but I think it is great to put the thoughts into words occassionally, even when they are just contemplative and rambling. Thanks for reading. And I hope you are enjoying whatever you are doing, wherever you are. Because, well, life is flippin’ short. Part of the reason I broke down is that I leave Thursday for Geneva, New York for a race on Saturday. This is an ITU race, draft-legal style format. I figured, what they hey, I have not raced these in about 2-3 years and I used to do only ITU racing. It will be a fun change for once, to actually get to draft on the bike. I have a homestay (whereby nice people open up their homes to allow me to stay! And helps immensely as it saves me 3 nights of a hotel!) and I am looking forward to a lot of Kelly-Time. The race is not until Saturday at 3:00 PM EST, so this gives me a plethora of time to chill out before-hand and get good and nervous! I found myself doing just that the past few days, but then I told myself that, well, this is not ‘my thing’ anymore…I am completely sold on the longer racing! I am so looking forward to racing in Racine, Wisconsin on July 22nd, this will just be a fun little ‘tune-up’. Now that my bike is packed (yes, a day early), I will continue to download music into my ‘Sansa-Pod’. Gotta take care of all the important stuff, right?